The mechanics of a 15 lb. IED exploding is more profound than you might even guess. The shock wave alone compresses your body and everything inside. First your ears rupture, then your organs, then your veins explode. The eyes in your head explode around the 40 PSI mark. If that doesn’t kill you the rapid heating of the air can cauterize your airway, cooking you from the inside out. 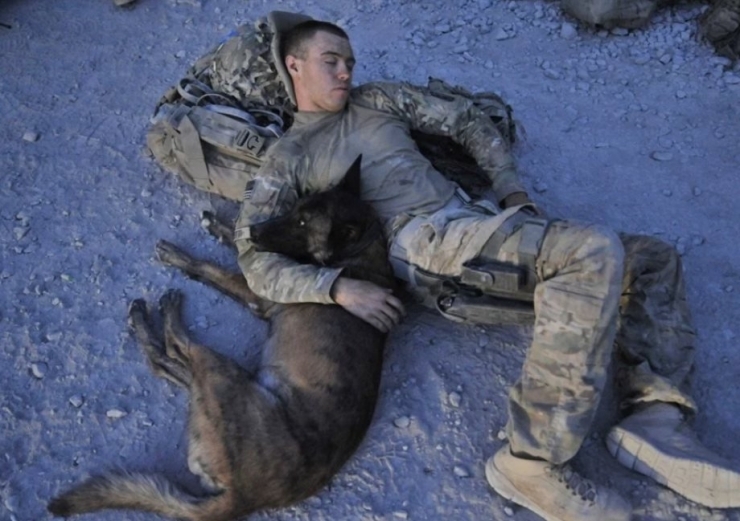 Then there are our four-legged guardians who protect our service men and women from this horrible end. 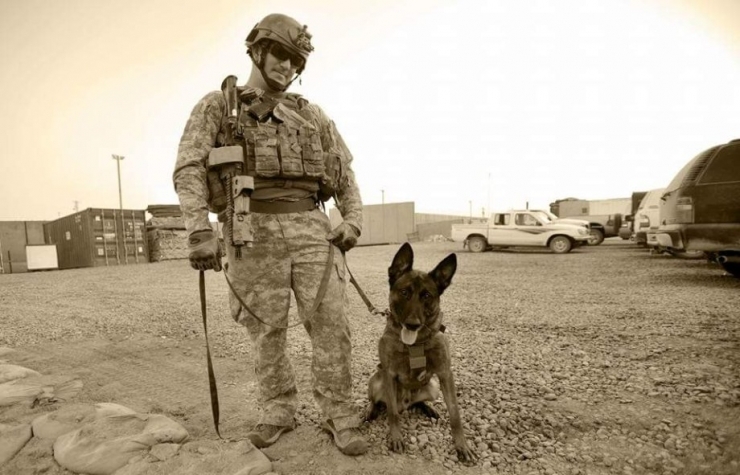 Dogs like Mike, a Belgian Malinois, a military K9 pictured here with his handler, Sergeant First Class Matthew Bessler. 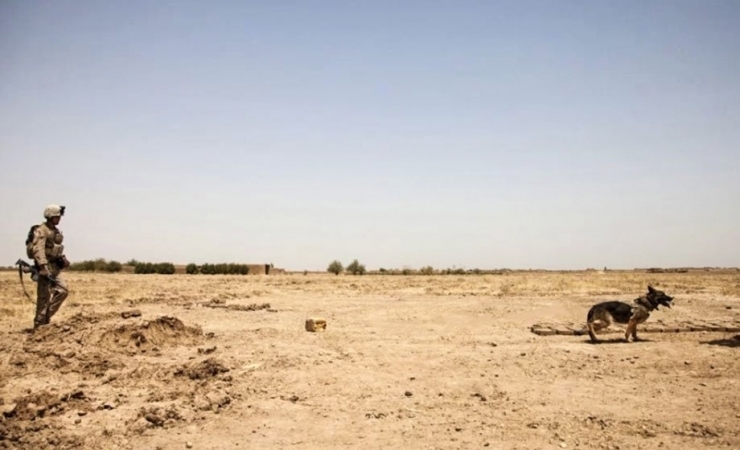 Mike had recently sniffed out a cache of EFPs and IEDs buried 3 feet under ground outside Baghdad. During “Major Mike’s” two tours in Iraq, he located over 2,000 lbs. of explosives and weapons and saved countless lives in the process. 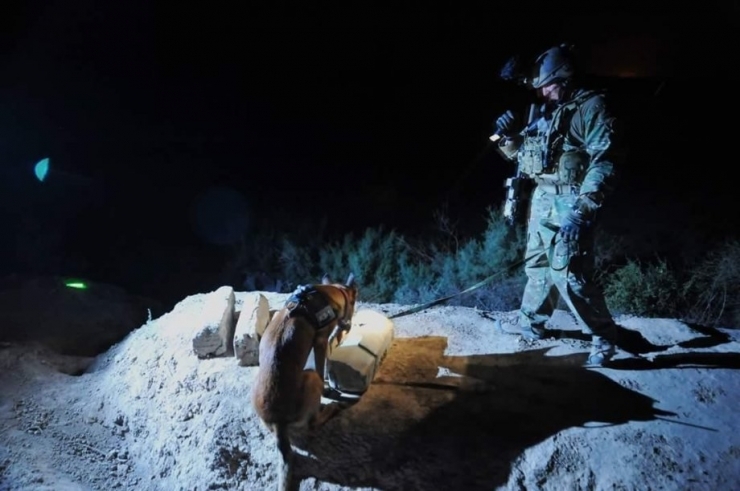 You might well ask how a dog is able to sniff out explosive buried so deep in the earth? 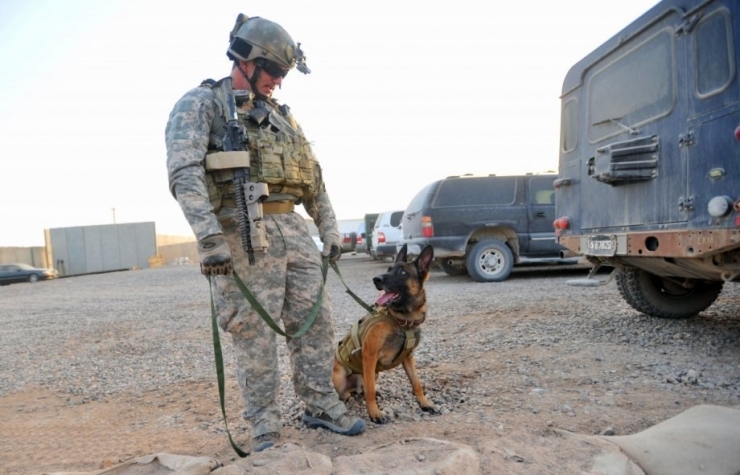 Many of these combat dogs are called MPCs (Multi-Purpose Canines) – Tracking, patrol, and explosives detection. 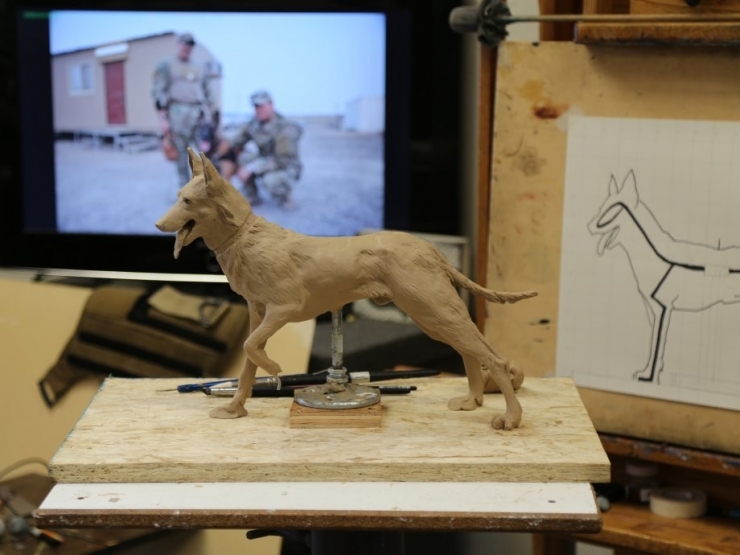 These service dogs lead the way onto the battlefield with their handlers close behind. 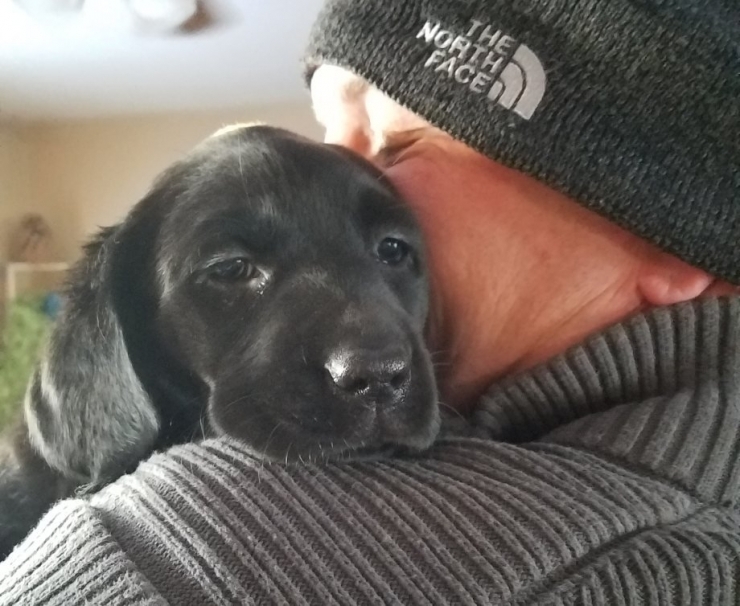 Their handlers establish a bond with their animals, a trust and love that few understand. But all pet owners can surely relate to some degree. Matt Bessler served as a Green Beret with 9 combat deployments spanning 21 years of duty. 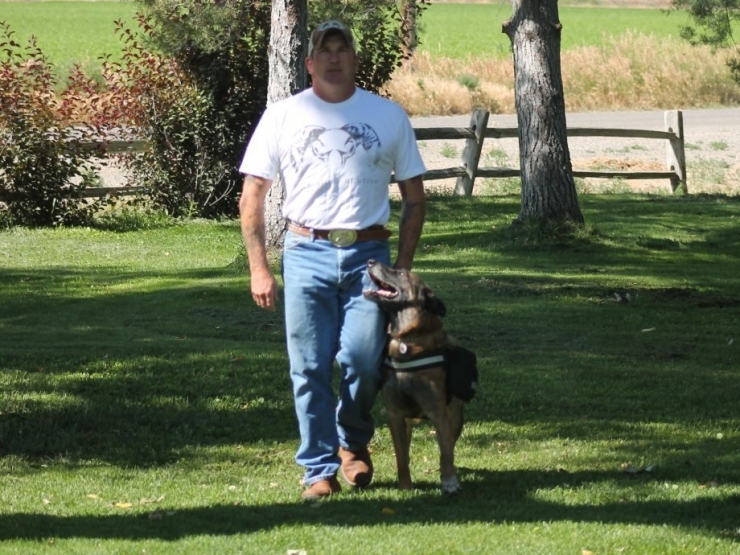 He was the first and only handler of Mike. Mike was trained at an elite training facility not far from theCHIVE’s hometown in Ft. Wayne, Indiana. Mike’s availability and flexibility were astounding even at an early age. Mike knew who was friend and foe. A dog’s mind can sense danger differently than humans. Mike intrinsically knew how to protect you. But most of all, Mike was a happy dog. 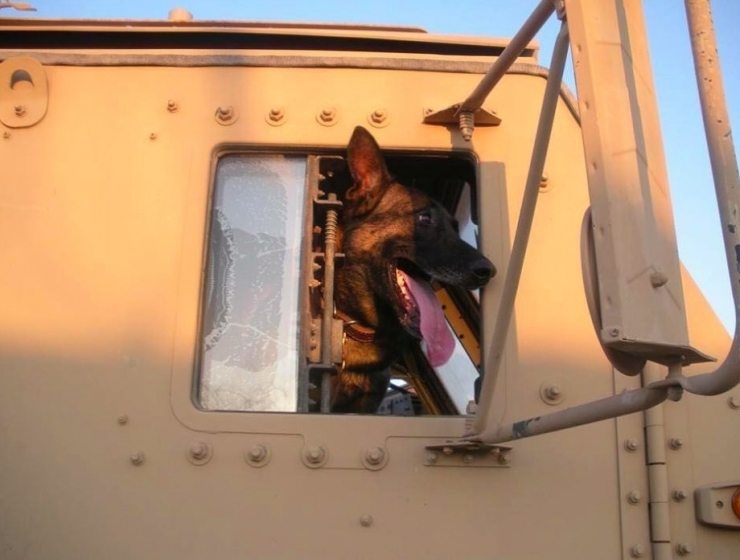 On Mike’s final tour, he would prove himself to be one of the greatest dogs to ever serve. Matt told me, “We were about to breach a door when Mike indicated. Always trust when a dog indicates. Turns out the door had explosive rigged to it. When we blew that door it triggered a secondary charge blowing another door. You believe that? Mike saved everybody. He wasn’t done either. Mike was the first inside the house and he found this wall, this nothing wall, and indicated. Finally after much deliberation one of our guys just walked up kicked a hole in that wall in revealing a huge cache of enemy weapons. Before he retired, Mike was promoted to Captain. Handlers are never allowed to keep their service animals but there are exceptions to every rule. Knowing the bond between the two was too strong to separate them, Matt was allowed to keep Mike and both retired to civilian life in the quiet farming community of Powell, Wyoming. Mike liked playing in the yard, which is what he was doing the day of October 15th, 2015 when Matt was away on a date with his girlfriend. That’s when a man riding a bicycle with a Judge .410 revolver strapped to his handlebar shot Mike. Mike didn’t die instantly. He limped back to the garage behind Bessler’s house where he laid down, and died. There were no witnesses. The neighbors were known to have loose dogs and the man who shot Mike was known to not like those dogs. The man claimed he was attacked by Mike but everybody knew better. A later autopsy would reveal Mike was shot from behind, contradicting any claim of an frontal attack. The 59-year old man was unharmed. Still, the man was never charged. The bicyclist carrying the equivalent to a handheld shotgun holstered to his handlebars was free to go. The late great Washington Post reporter Sarah Kershaw chronicled the suspicious events of that day. Donations poured in from across the country. $10,000 was raised to help Matt pay for a burial with military honors, war dogs are not entitled to funerals or burials with military honors. For Matt, he has lost a family member. “Mike was my other half” he told a local paper. 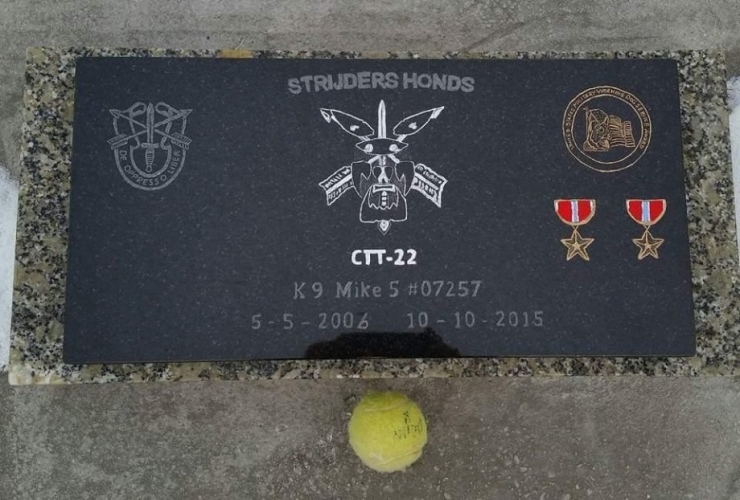 Mike was buried on Veterans Day with Matt’s two Bronze Stars and his favorite tennis ball. 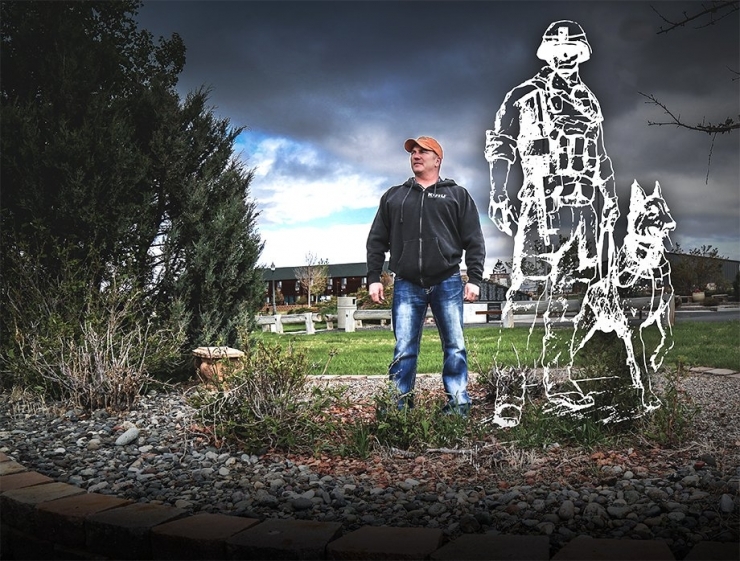 On that grey and ominous day, Matt promised to create a War Dog Memorial in Wyoming honoring not only Mike, but all service dogs, past present and future. We’ve teamed up with Marcus Luttrell and Lone Survivor Foundation to erect this memorial. For every $10 you donate, you will be entered to win the opportunity to be flown to Houston to have dinner with Marcus and I at a restaurant of his choosing. Sorry, Marcus wanted me to clarify – a steakhouse of his choosing. Marcus also lost his service dog to a senseless killing in 2012 and wants nothing more than to see this memorial built. 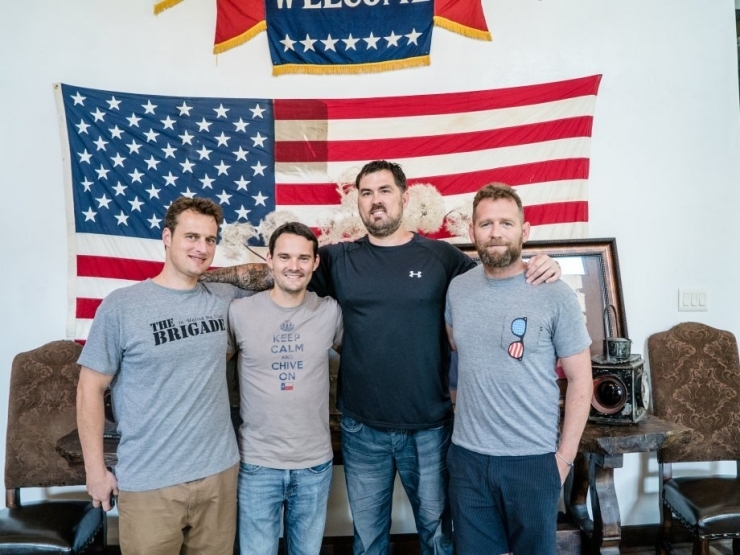 Your chance to have dinner with the Lone Survivor is truly a once in a lifetime opportunity. See rules here. There are other dogs out there, just like Mike. 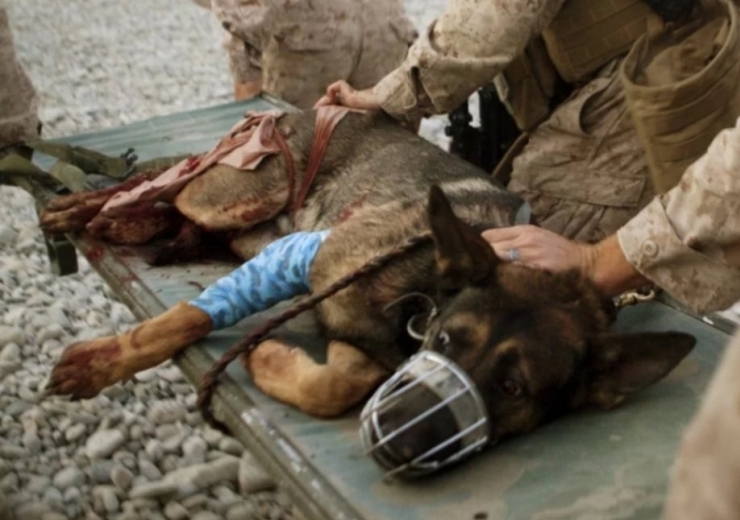 Dogs with no voice or legacy who died serving our country. Dogs that bravely saved the men they served, sniffing out 15 lb. IED’s one at a time. They are the unsung heroes; now we must step up to be their protectors. I always thought that quote was overly measured until today. It’s not. It’s a call to simply do right by those who protect you. The goal is set at $110,000. 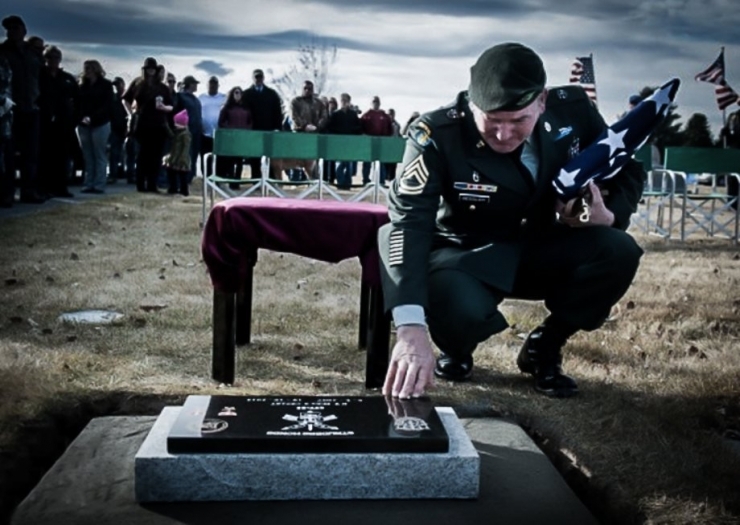 Chive Charities Green Ribbon Fund members have taken point by donating a whopping $60,000 toward the cost of building Wyoming’s first War Dog Memorial. I now leave it to the Chive Community to bring it home. The remainder needed to smash the goal is $50,000. The dedication will be June 16th, 2018 and all who donate will be invited. I will see you all there. Matt Bessler’s promise to Mike is now in your hands. I have every faith in you.